Ready for a short walk (sneakers only). Photo by Frank Bell. The Appalachian Trail, which stretches over two thousand miles from Georgia to Maine, enters New Jersey at the Delaware Water Gap, heads north along the Kittatinny Ridge to High Point, then east through the Pochuck Valley. Before turning north again, across the border to New York, the 72-mile New Jersey section gives a view and a feeling of what this area was like two hundred years ago. The surrounding countryside is mostly undeveloped, and the few towns visible in the valleys remain rural villages. Striking panoramas—comparable to those in the Blue Ridge, Berkshire, and White Mountains, even the fabled Great Smokies—are not uncommon along this rugged and remote section of trail. 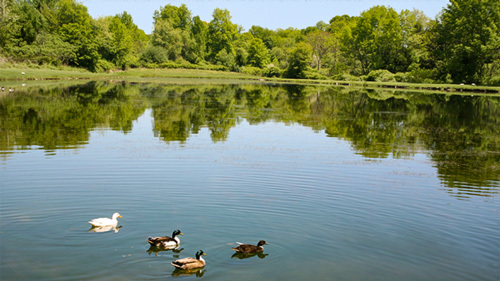 You can explore the midsection of New Jersey's Appalachian Trail (known by hikers simply as the "AT") as it traverses two of our most celebrated state parks—High Point and Stokes Forest—and the Delaware Water Gap National Recreation Area, along a 45-mile route along the Kittatinny Ridge through Sussex and Warren counties. Country lanes or park roads every few miles intersect the entire stretch so that you can plan any number of modest day hikes along the AT. Or take a couple of days to walk the whole distance. Elevation in this section ranges from 350 to 1,685 feet, and, if you prefer to walk downhill most of the time, hike north to south. The equipment requirements for an Appalachian Trail day hike are minimal, but respectable hiking boots are essential: high enough to support your ankles with thick soles, and large enough for heavy socks and swollen feet. Don't wait until the day of your hike to break them in. A light pack and a canteen should complete the necessary gear. The pack will hold lunch and a snack or two and will be useful to carry out your refuse as well as any litter you may find along the way. Each hiker should start out with a full canteen. Some sections of the Trail are dry, and you will cross an occasional spring. But most of the Trail is on mountain tops and most of the water you will see will be far away in a stream or pond in the valley. So fill your canteen whenever possible. Check online or with your outdoor supplier for available purification filters or tablets. The Trail lifts near Sunrise Mountain then peaks over the top. Photos by Frank Bell. Finally, bring binoculars and a camera. The Trail follows the highest ridges of the Kittatinny Mountains and the views are breathtaking. Wildlife is abundant, too. If you are interested in birds, you're in paradise. You will see plenty of hawks and eagles, and those denizens of the Trail, the little towhee. Keep your eyes open; there's a good chance you'll spot a bear, and rattlesnakes make occasional appearances. And to protect against the ones you can't see—namely the dreaded deer tick—the common advice is to wear a long sleeved shirt tucked into light-colored long pants tucked into closely knitted socks. Any decent road map of New Jersey will show the Trail, usually as a dotted line along the ridges of the Kittatinny Mountains, which run parallel to the Delaware River to the west. The park ranger offices at High Point on Route 23 in Sussex, Stokes Forest on Route 206 in Branchville, and the National Park Service visitor center on Route 80 at the Water Gap in Warren County, will have maps that will include other local trails. And there are countless Web sites packed with information and maps of the Appalachian Trail. The Trail itself is marked generously with white painted blazes, two by six inches, on trees and rocks along the way. Two blazes, one above the other, indicate a change in direction of the Trail. Be alert for this; the Trail won't always go where the hiker expects it to. Some of the following suggested day trips are short, and combining two of the routes into one day's hiking would work out fine in most cases. Don't try to break any speed records. A leisurely pace will span the distance easily in five or six separate day trips. Or, if you are in-shape and experienced, split the span into two or three parts. The Appalachian Trail is world-famous, and on a weekend in the middle of the summer it's bound to be crowded. So, if possible, plan your trips for mid-week, or start very early in the day. Stopping points along the mid-section of the Applachian Trail in New Jersey. You and some friends can warm up with a short three-mile jaunt through the monument section of High Point State Park. 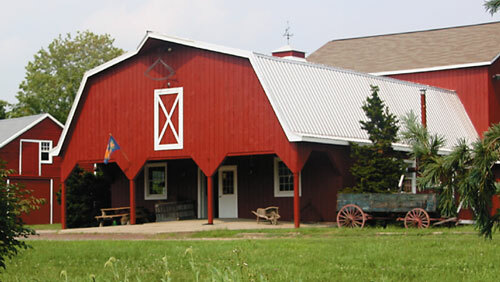 First, drive two cars to the park office on Route 23 north of Sussex Borough. Park one car, pick up a map, and drive the second car down the hill south on Route 23. Watch for Route 519 on your left, turn north and go to the parking area just north of Mt. Salem Road. Embark upon the AT, following the white blazes as they climb back and forth toward the High Point monument. You'll notice a short trail leading to the High Point trail shelter for through-hikers, then pass the trail that leads up to the Monument or to Lake Marcia to the right. Another half-mile brings you to an observation platform with views all around. Then you'll walk towards Route 23 just north of the office parking area where you left your first car. High Point: Route 23 to Deckertown Road. A half-mile in from Route 23, you'll cross the red-blazed Iris park trail and climb up to follow a rocky ridge with scenic views of the surrounding valleys and ridges, Sawmill Pond, and a particularly nice vista at what is known as Dutch Shoe Rock, near a sign pointing to the Rutherford Shelter on another, blue-blazed trail. Follow the AT's white blaze as it crosses the Iris trail again, drops down through wetlands, and leaves High Point, about five miles south of your starting point, at Deckertown Road. If you want to deliver a car there in order to return to your starting spot, or to begin your walk another day, Deckertown Road runs west from Route 519. A couple of miles from the intersection there is a small parking area on the right, with a sign bearing the AT mark where the Trail meets the road. The AT proceeds along the eastern edge Stokes Forest, climbing towards the Mashipacong Shelter for through-hikers, then through mountain laurel before crossing Crigger Road. Then it ascends towards the Sunrise Mountain parking area, about three miles in, near the 1650 ft. summit where there are spectacular views in all directions. There are more excellent views further on, south along the ridge roughly parallel to Sunrise Mountain Road, crossing Stony Brook, towards the Culver Fire Tower. Another mile or so and you'll approach the Culver's Gap parking area, about eight miles from Deckertown. If you want to make this a stopping point, you can drive your getaway car on Route 206 north of Culver Lake, turning east on Route 636 (Upper North Shore Road) at the sign for Sunrise Mountain. A quick left takes you up the mountain where you'll find the parking area. 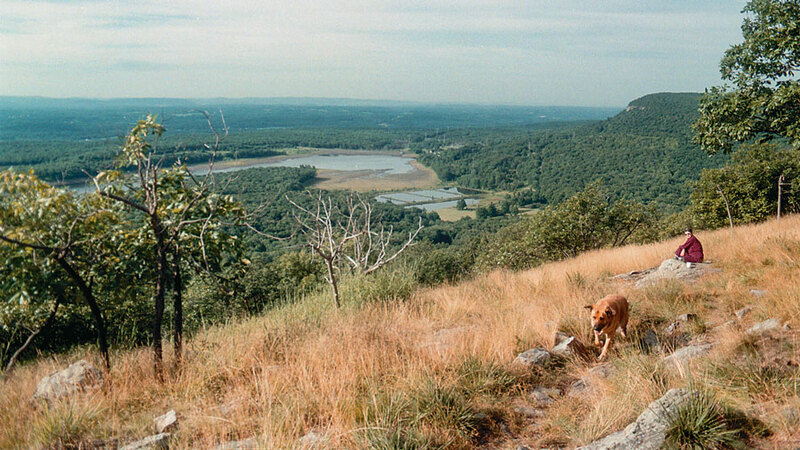 Or continue about eleven miles to the Stokes southern boundary, climbing first past Kittatinny Lake down below to your right towards a rock outcrop at the top of Rattlesnake Mountain five-and-a-half miles in. Further along you'll see a blue-blazed trail to Buttermilk Falls, a worthy two-mile side trip west into the Walpack valley. Watch the white blazes closely, as you leave Stokes and enter the Delaware Water Gap National Recreation Area, skirting Crater Lake to the east then Long Pine Pond to the west. The Trail crosses Blue Mountain Lakes Road where there is ample parking and a good place to rendezvous. Driving to the Trail's junction at Blue Mountain Lakes Road entails leaving Blairstown on Millbrook-Blairstown Road (County Route 602), up then down the ridge into Millbrook Village in the Recreation Area. Turn right on Old Mine Road and travel to Blue Mountain Lakes Road, marked by a grand old building known as the Delaware View House. 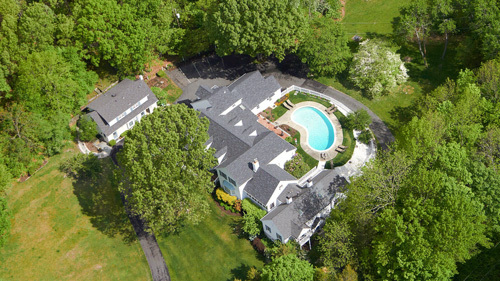 (You can also get to the intersection by going north about ten miles from the last NJ exit on Route 80.) Turn up the hill and drive almost three miles to the top. 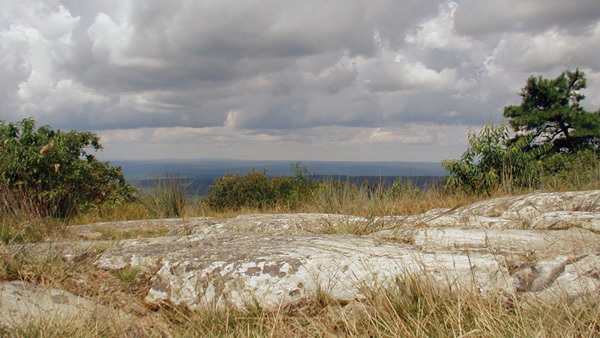 Hikers look out over Warren County. Photo by Mary Jasch. From Blue Mountain Lakes Road it is a little more than seventeen miles to the Water Gap. The Trail follows the Kittatinny Ridge for about three miles towards Millbrook-Blairstown Road. If you want to cut your hike short, leave a car here. Then it rises towards the Catfish Fire Tower about two miles later before lowering again down towards Catfish Pond Gap, Camp Road and the Appalachian Mountain Club's Mohican Outdoor Center above Blairstown, a frequent stop for AT through-hikers. You can motor here by taking Mohican Road west from Route 94 until it meets Gaisler. Turn left, then right on Camp Road into the AMC facility. 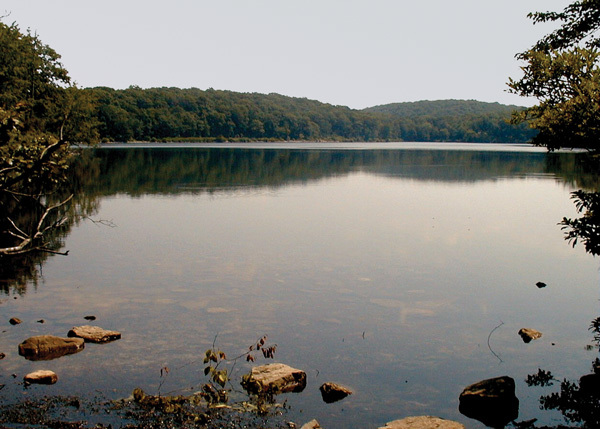 From Catfish Pond and the AMC Center, you're on your way to Sunfish Pond, along the ridge on a level stretch past the Upper and Lower Yards Creek Reservoirs. If you haven't yet been there, you've probably heard of Sunfish Pond, a mountain-top, crystal-clear glacial lake, an irresistible spot to stop and picnic. From Sunfish there are many alternate routes to the point overlooking the gap, or back down along Dunnfield Creek, but the AT begins a rugged, ever-increasing descent for three-and-a-half miles toward the Dunnfield lot along Route 80 at the Water Gap. More ambitious hikers on the New Jersey Appalachian Trail might be thinking of combining a couple of the shorter hikes, and this can certainly be done. But if you don't hike a lot, remember that the Trail is rugged and that too big a bite at the beginning might prove exhausting to the point of spoiling the experience. However, when the neophyte hiker has completed the day hikes, one at a time, the next challenge will be to repeat the whole performance as one 42-mile overnight hike. By all means, do it! Right now is the time to prepare for a fall hike of about three days and two nights duration. Some additional equipment will be required—a tent, sleeping bag, cooking utensils, and a bigger back pack—but there's plenty of time to find what you need. The Trail in the autumn is especially beautiful, and secluded, and the hiking temperature will be ideal. For additional information about the Appalachian Trail, the Internet is very handy. And you'll likely find hikers tweeting all the way from Springer to Katahdin. But you should arm yourself with maps so you don't miss all the great side trips and nooks and crannies along the way. 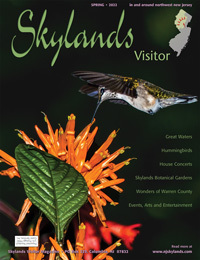 Each state park issues a trail map, as does the National Park Service for the Delaware Water Gap. There is all kinds of literature about the Appalachian Trail experience, all worth reading. 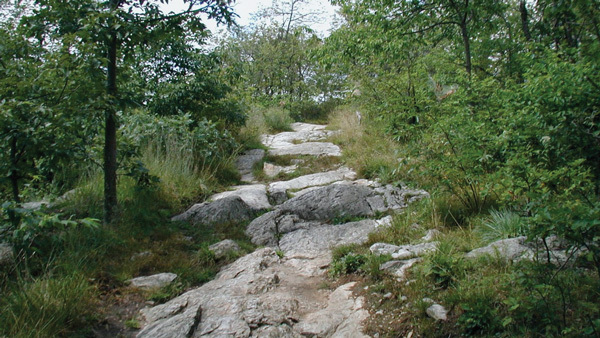 If you're making the AT a way of life, you'll need a copy of official AMC Guide to the Appalachian Trail in New York and New Jersey, by Daniel D. Chazin, now in its sixteenth edition. Or Exploring the Appalachian Trail: Hikes in the Mid-Atlantic States by Glenn Scherer and Don Hopey. Relax and enjoy this delightful experience. Keep in mind the words of Myron Avery, the first person to hike the entire trail: "Remote for detachment, narrow for chosen company, winding for leisure, lonely for contemplation, it beckons not merely north and south but upward—to the body, mind, and soul of man."